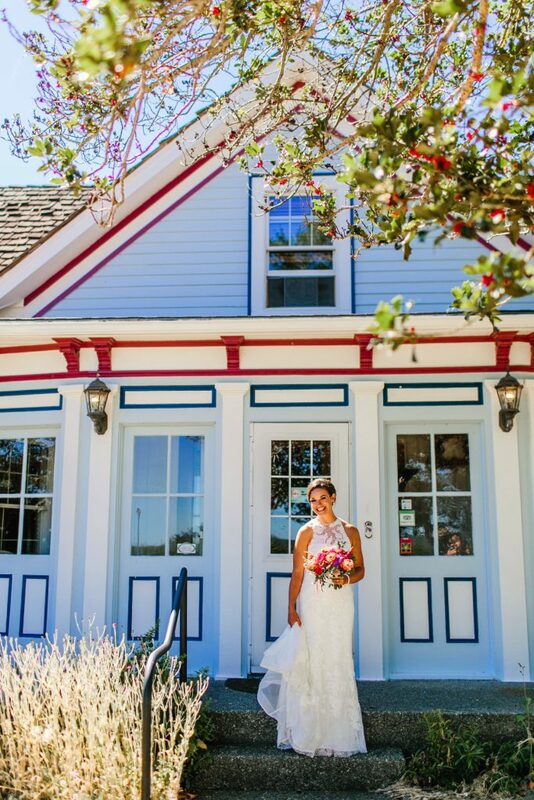 I love color, and am always thrilled to work with others who do too. 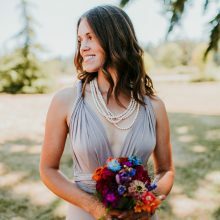 When Jackie told me her palette, I could hardly wait to start designing! 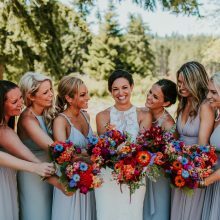 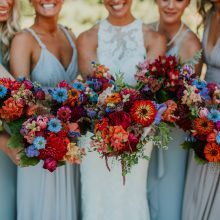 A jewel-toned summer wedding flowers palette gives the opportunity for things be saucy and fun and spicey, but still feel balanced by the inclusion of purples and blues. 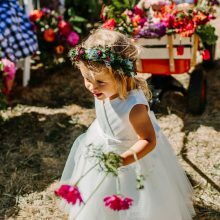 High summer season presents us with an abundance of blooms. 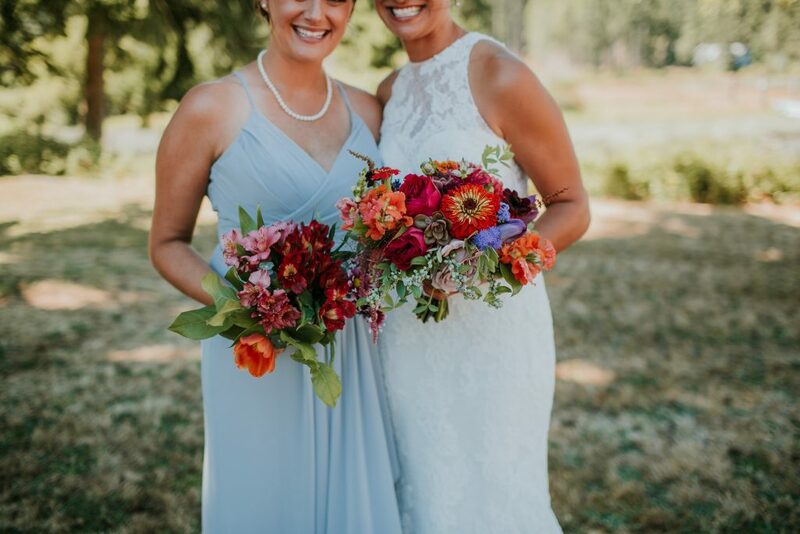 It was so fun to celebrate this couple with locally grown flowers. 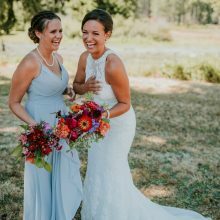 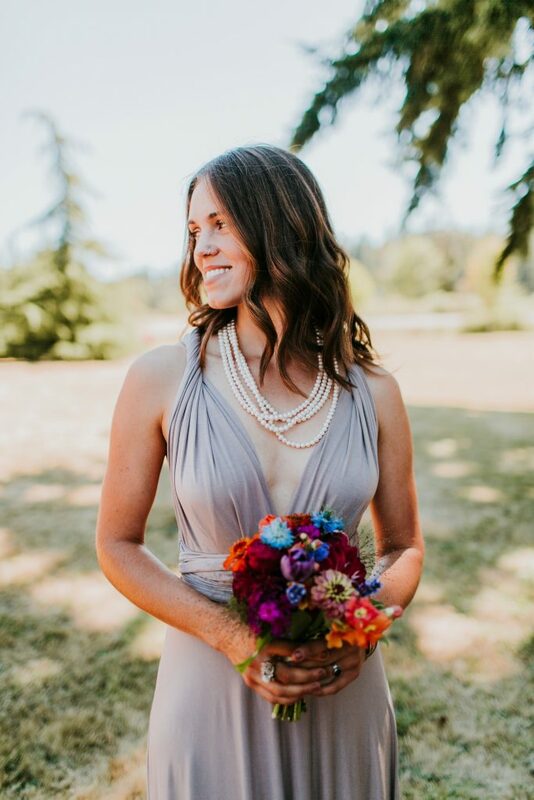 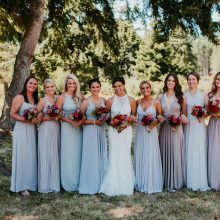 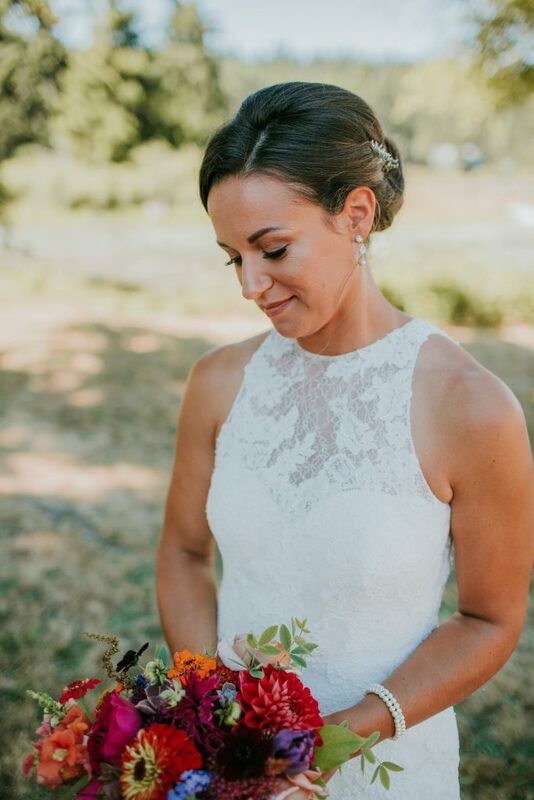 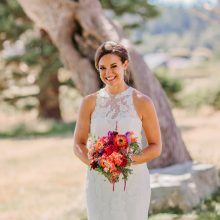 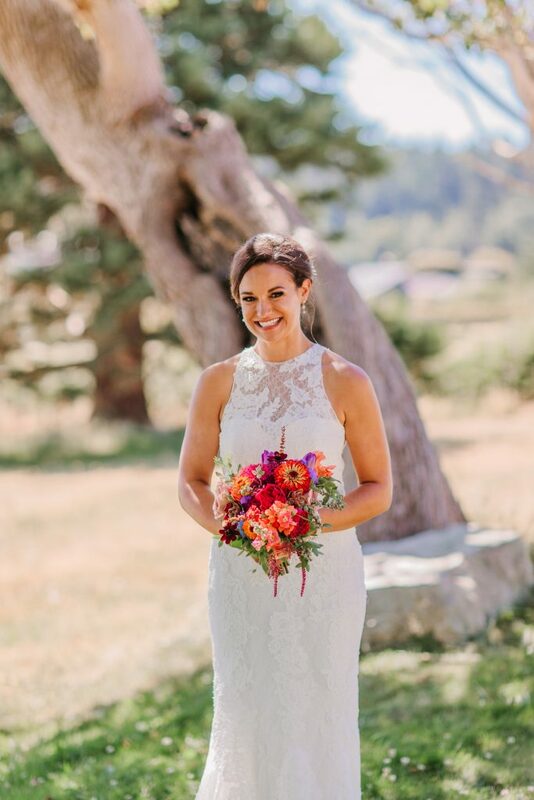 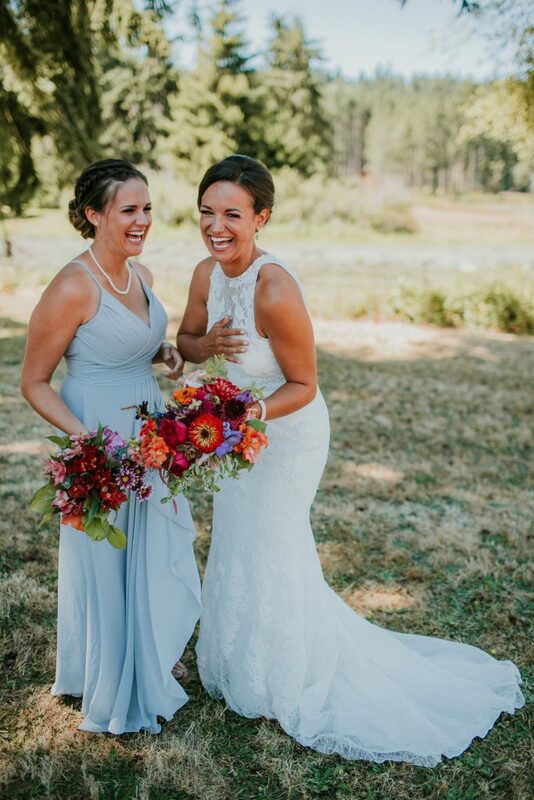 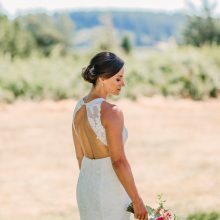 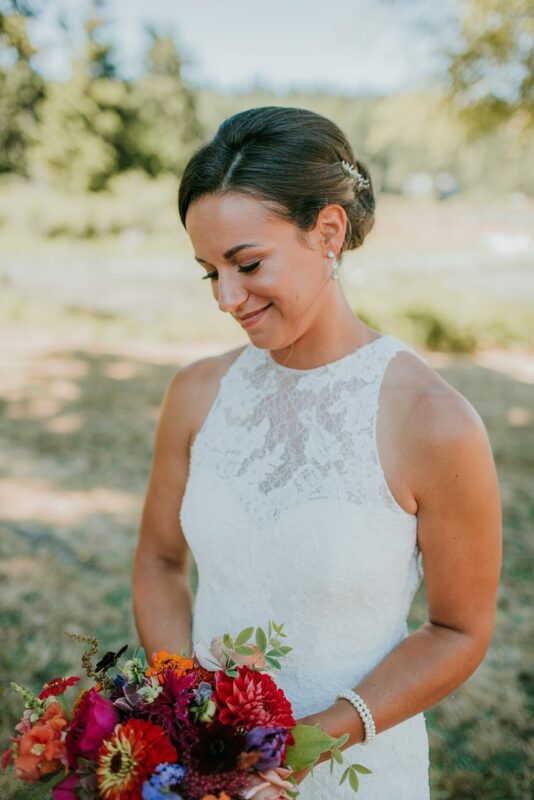 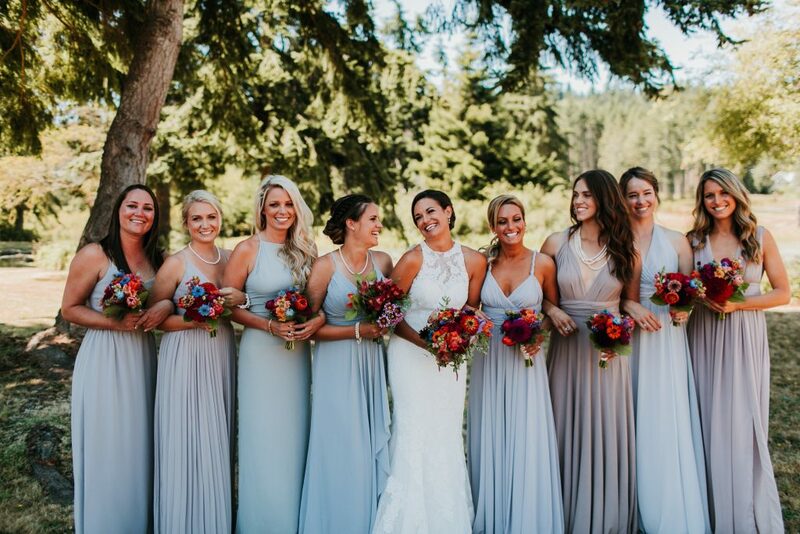 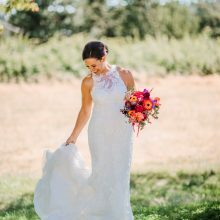 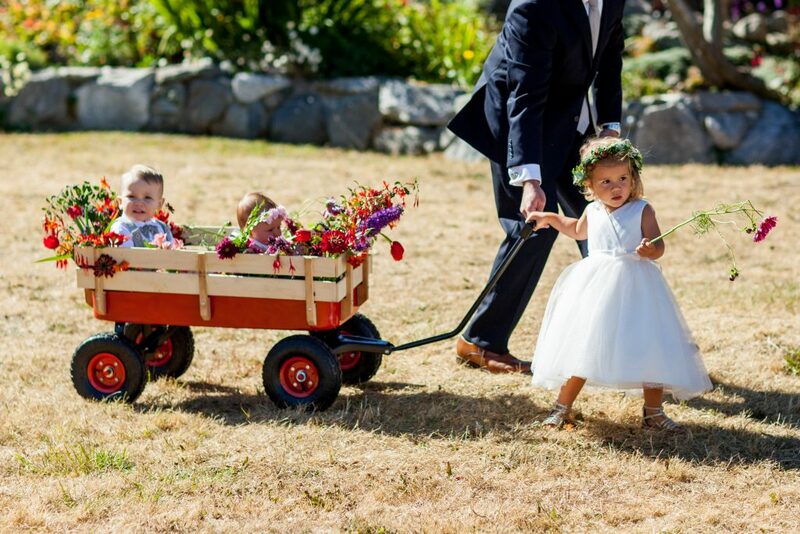 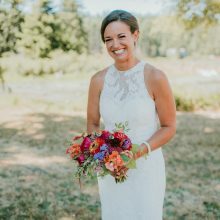 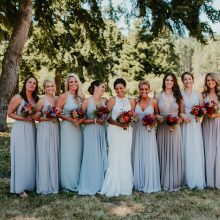 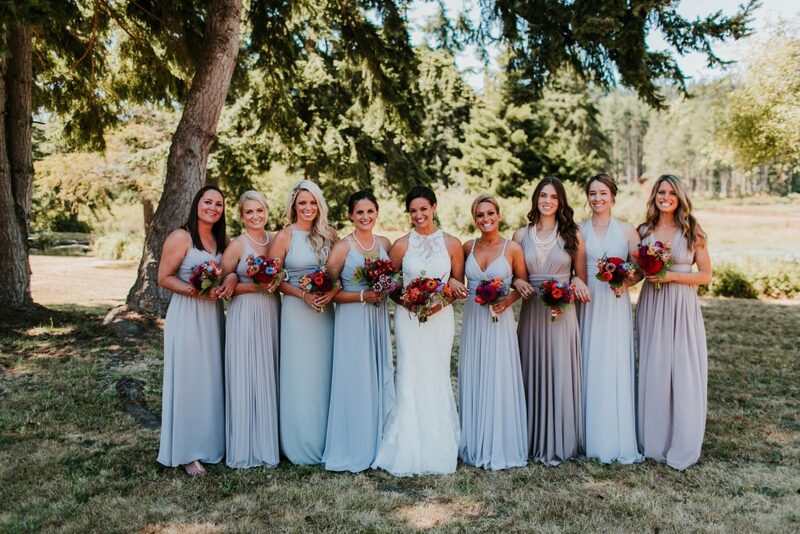 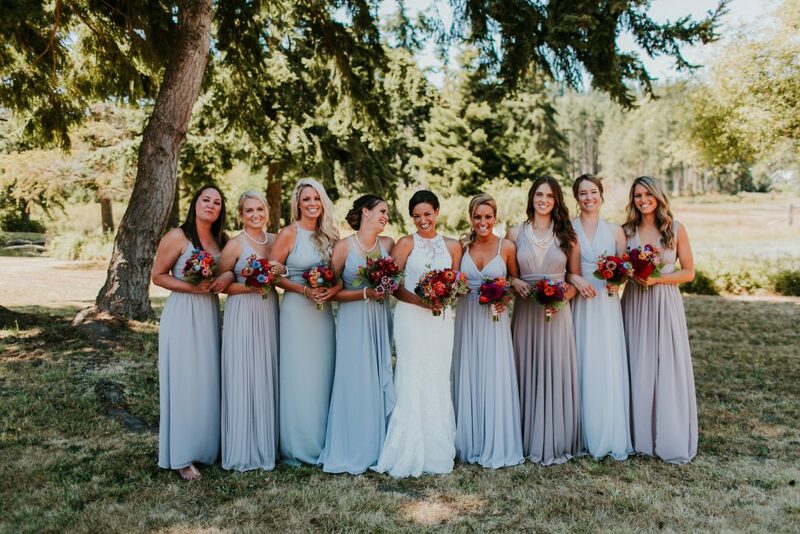 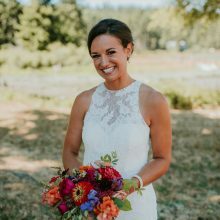 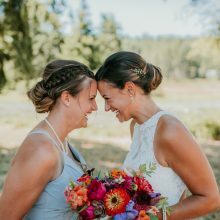 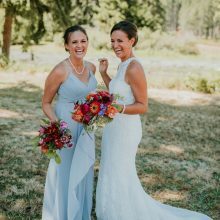 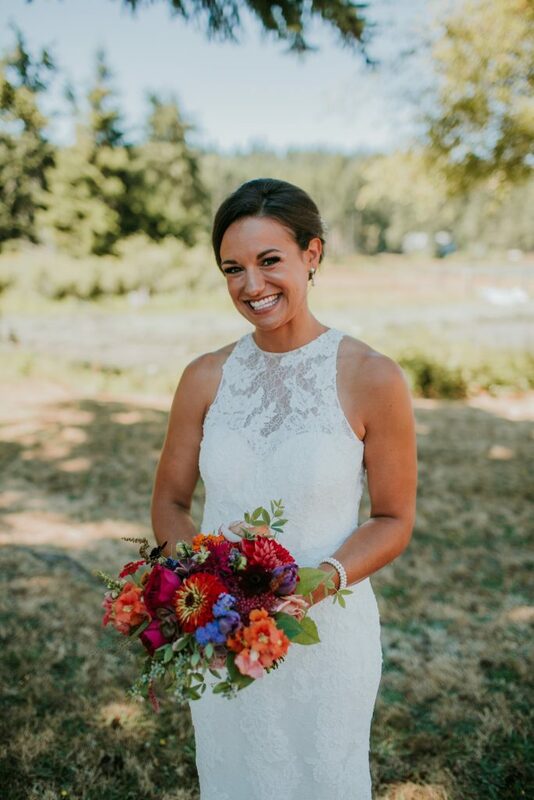 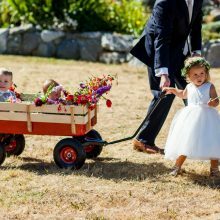 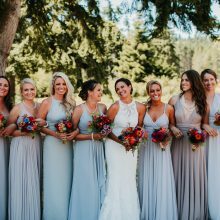 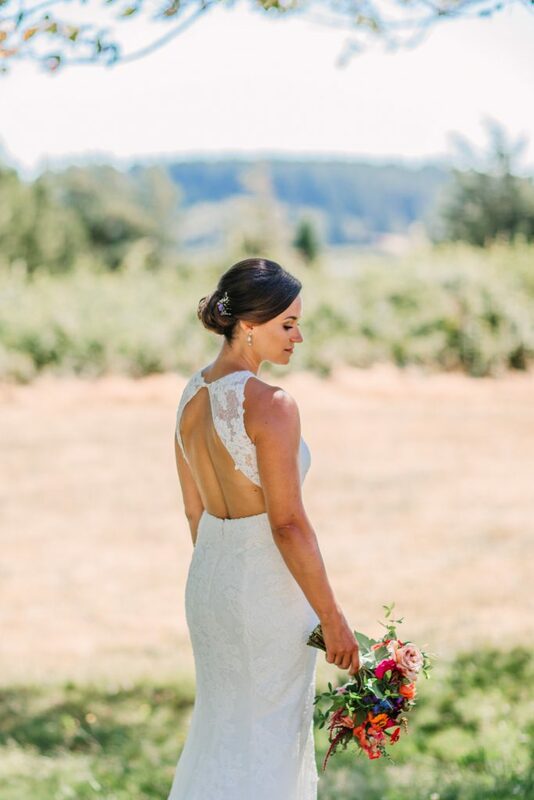 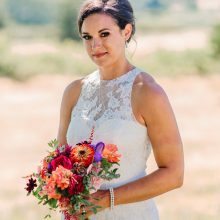 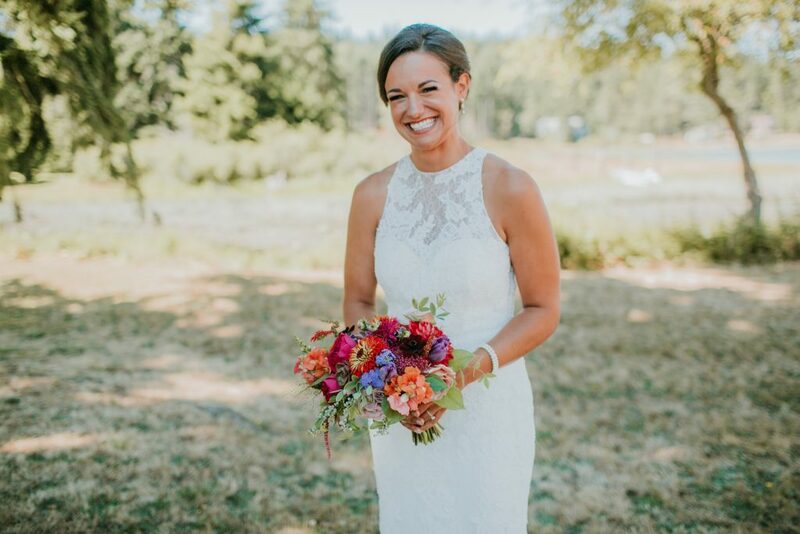 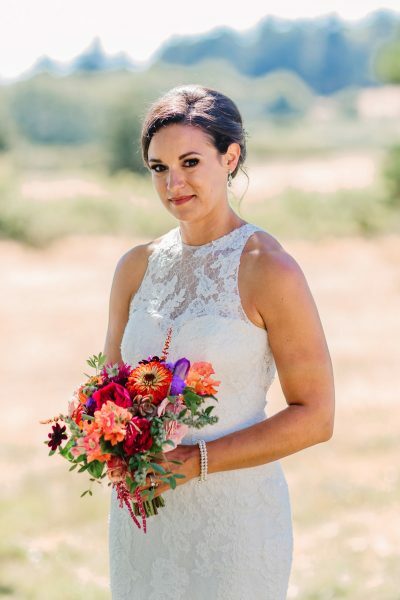 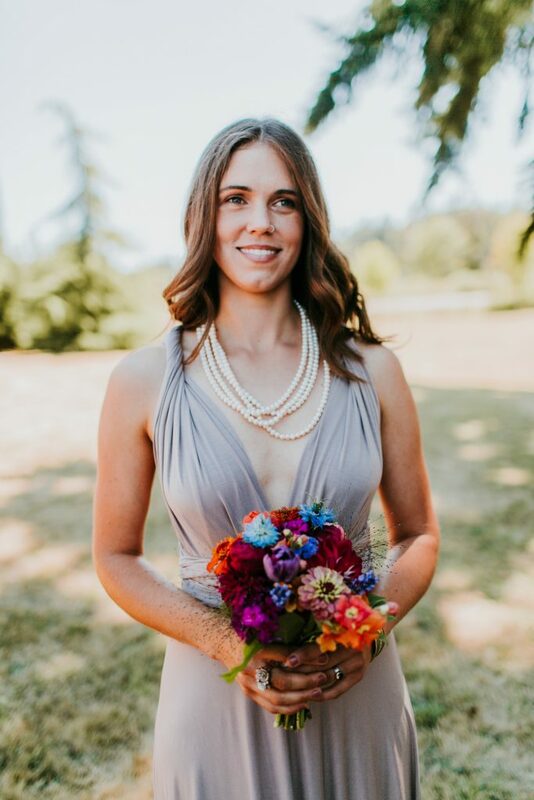 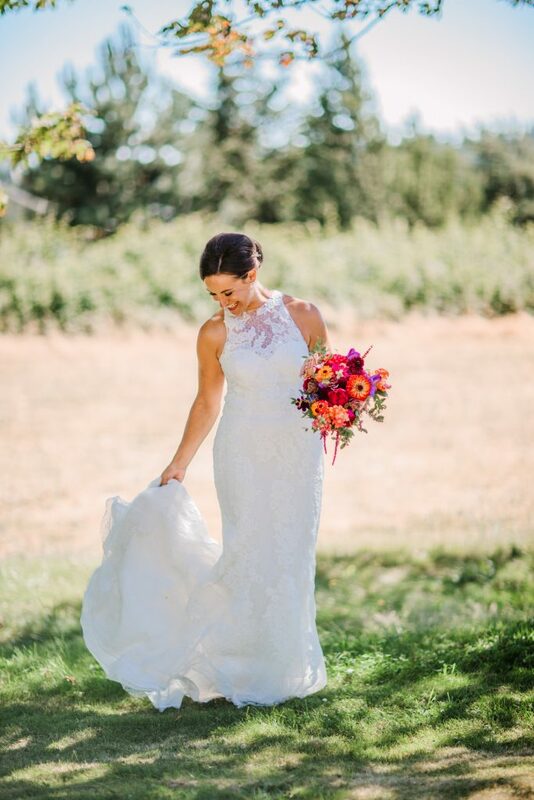 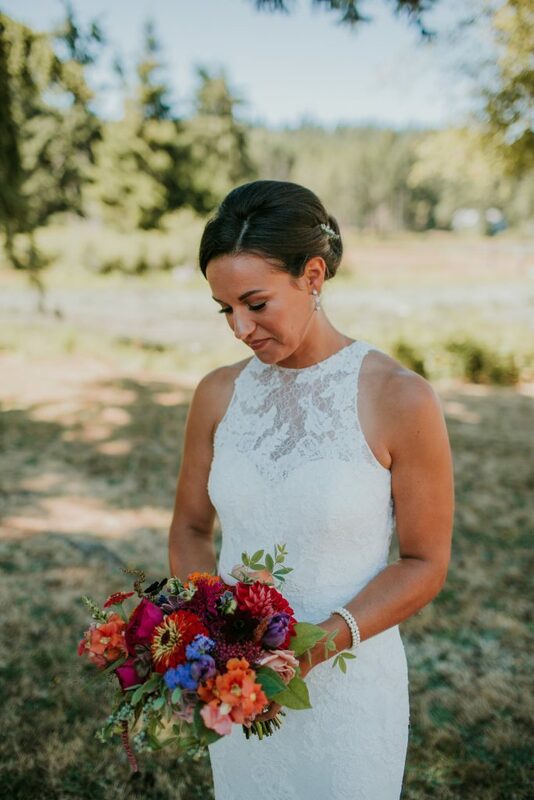 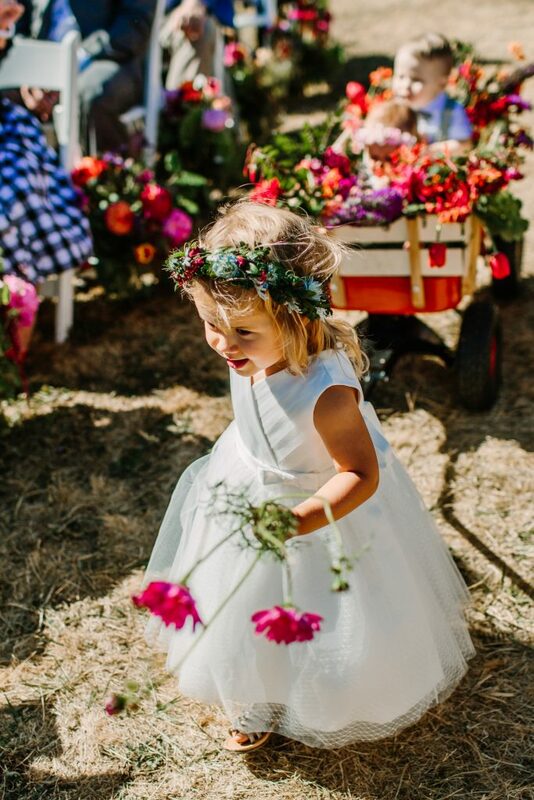 For this Whidbey Island summer barn wedding, we decided to primarily keep to garden flowers. 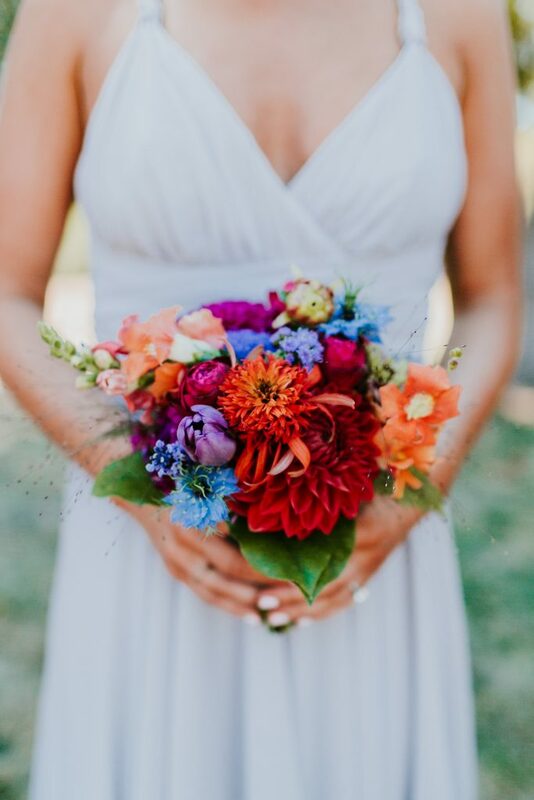 Dahlias, Zinnias, Snapdragons and Roses in warm and spicey colors were balanced with Nigella, Ageratum and Lavender. 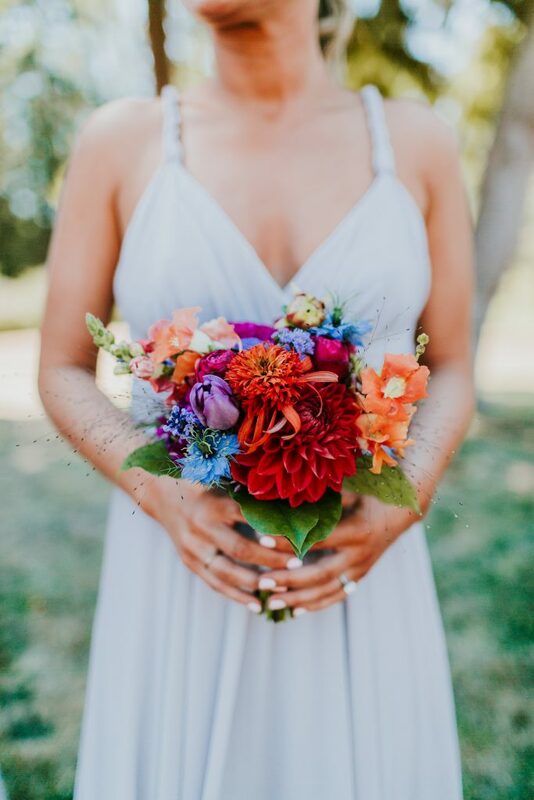 A close family friend owns a local Tulip farm and saved loads of Tulip flowers for us to include – that was fun, unusual opportunity. 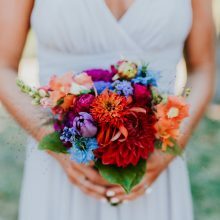 I’ve never paired Dahlias and Tulips before – but I like it! 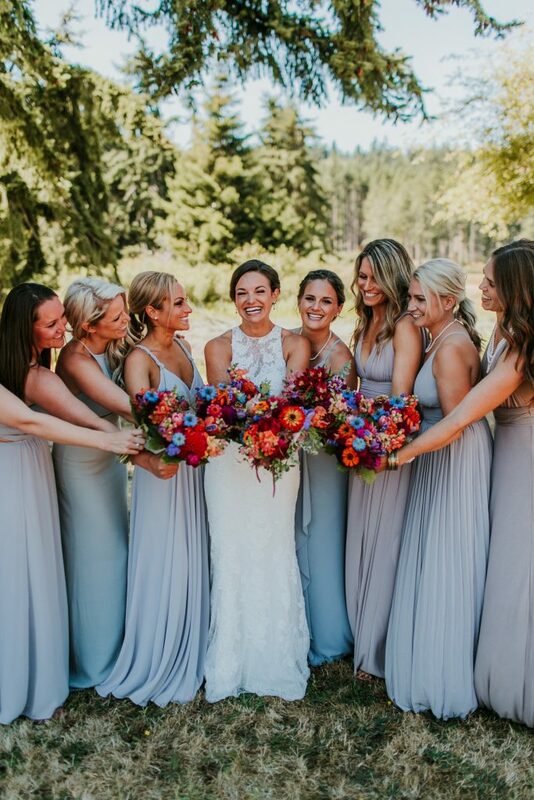 Jackie wanted a bridal bouquet on the smaller side, a little bit rustic and natural, but not all wild and fly-away. 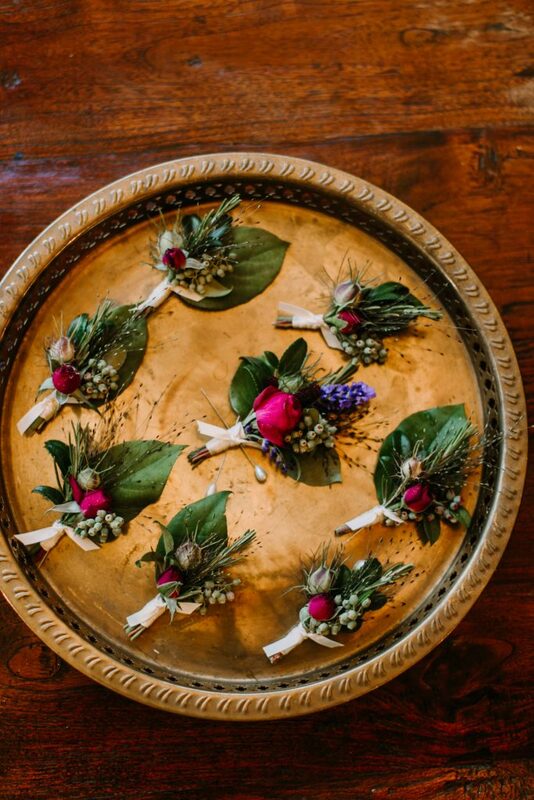 I tucked a few Sedums and some fruited Huckleberry branches infor bit of extra pizazz. 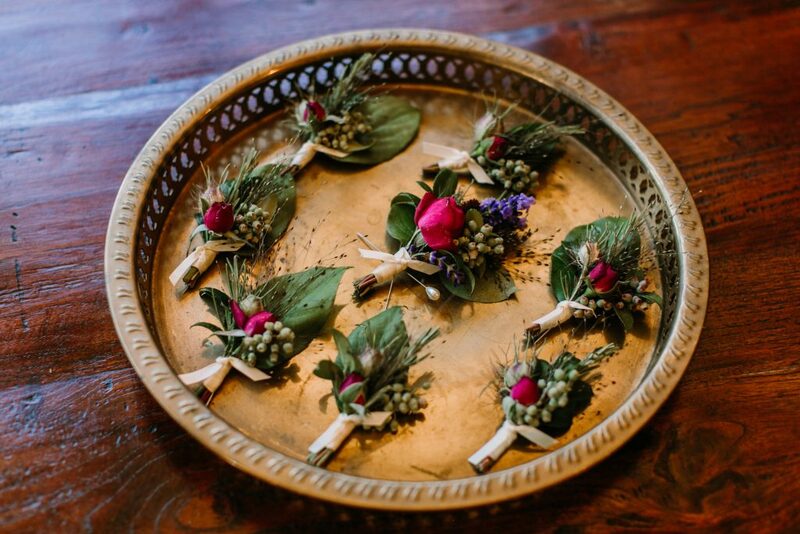 I trimmed all the bridesmaid bouquets in Salal foliage since we have such a natural abudance on the Island. 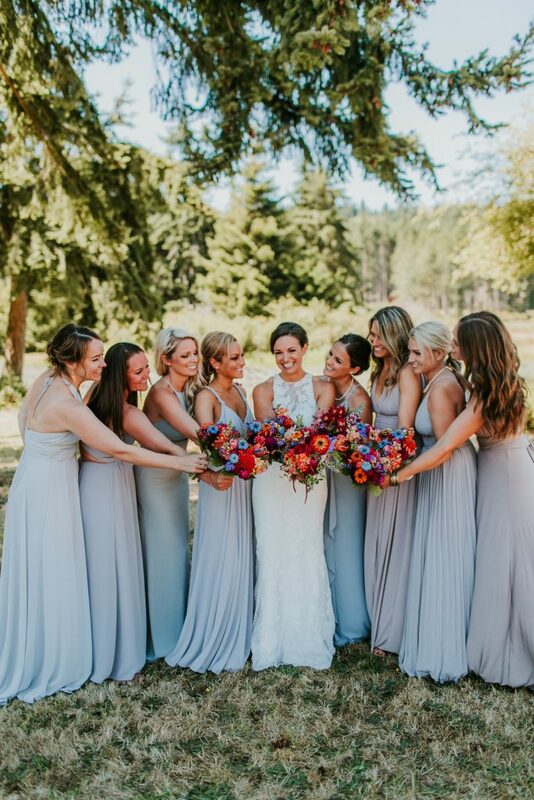 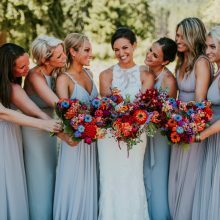 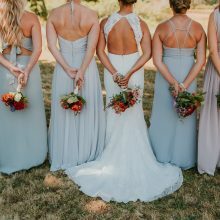 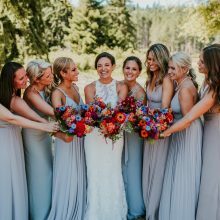 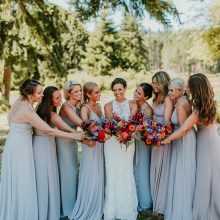 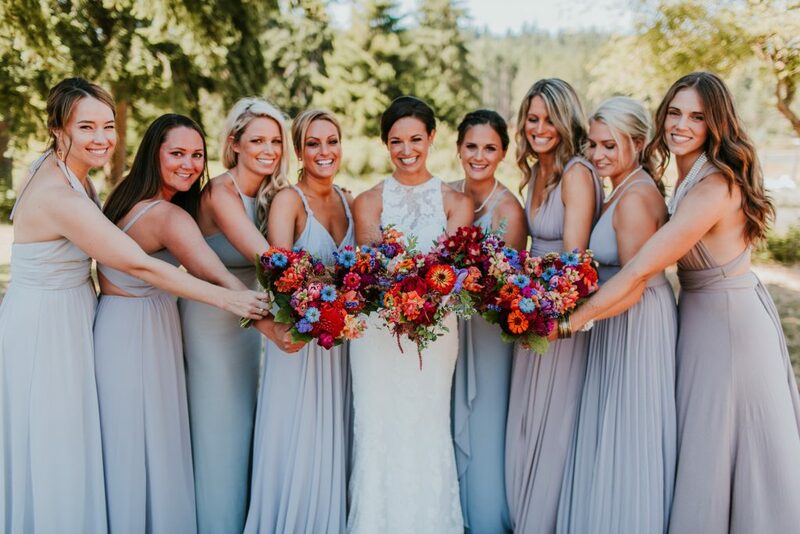 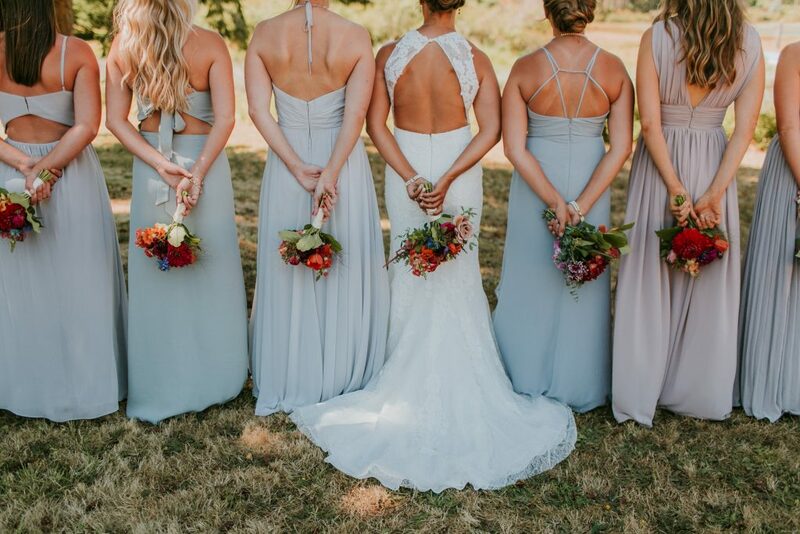 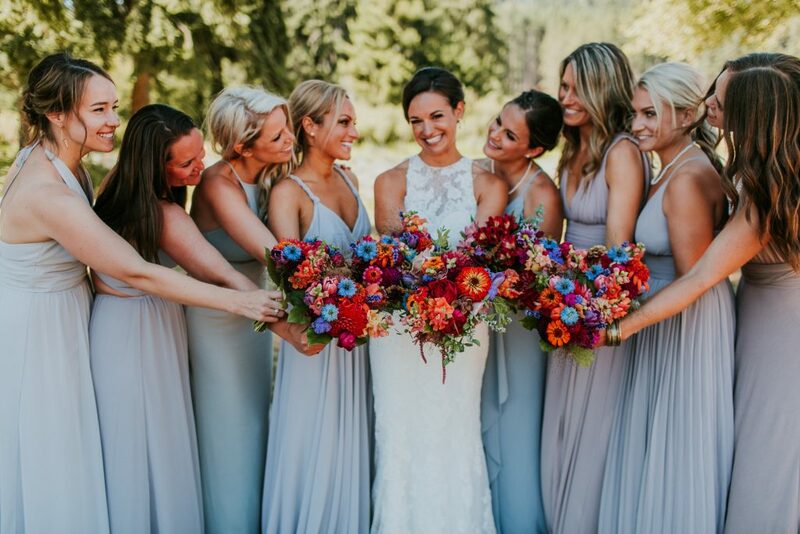 The colorful bouquets look great with the soft grey tones of the girls’ dresses. 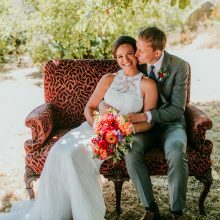 Jackie and Mark are big hikers. 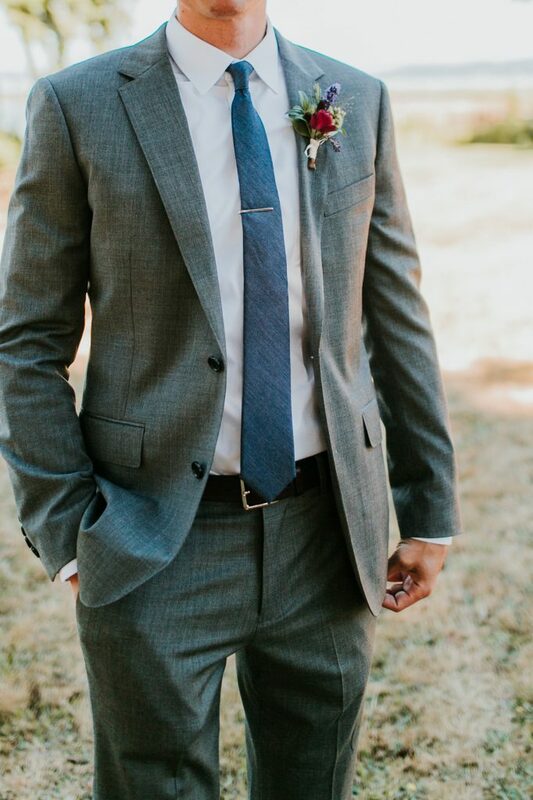 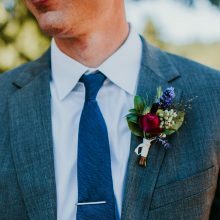 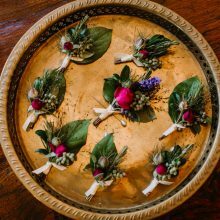 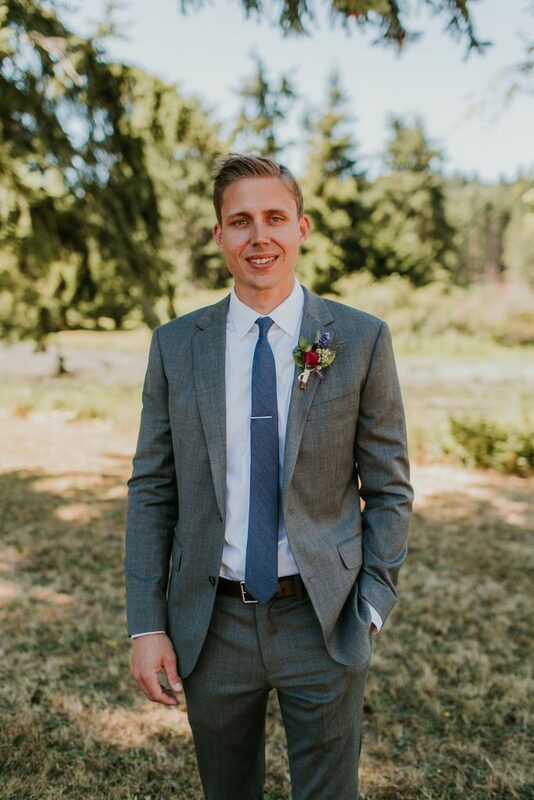 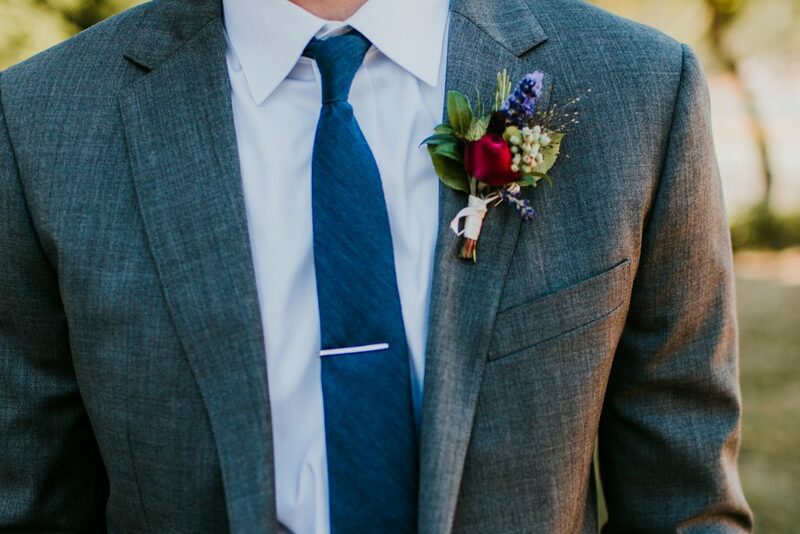 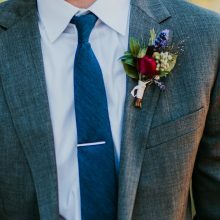 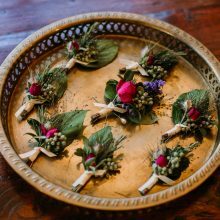 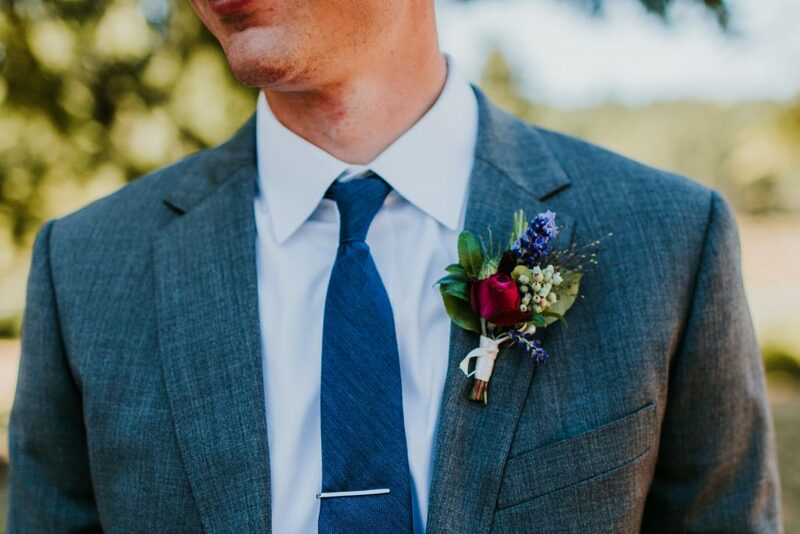 They love the Pacific Northwest, and wanted to include native plants Salal and Huckleberry in the boutonnieres. 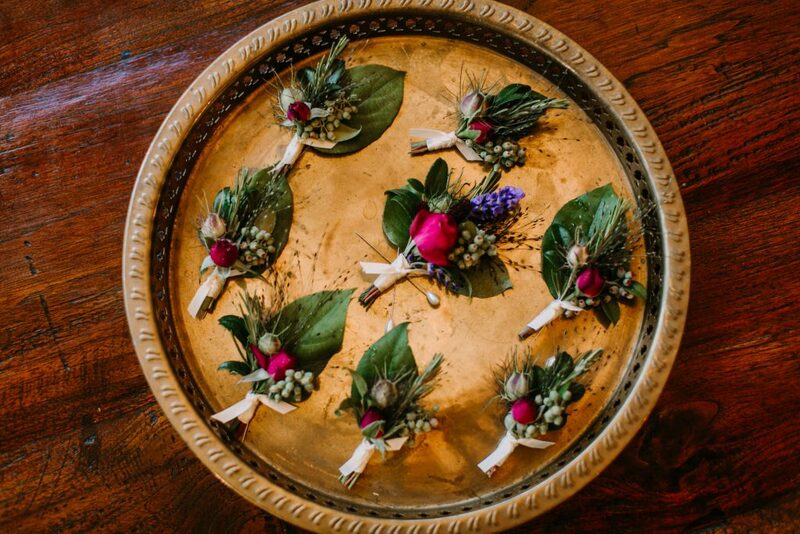 To add color I included Rose and Lavender, and used ornamental grass and Love-In-A-Mist pods for texture and accent. 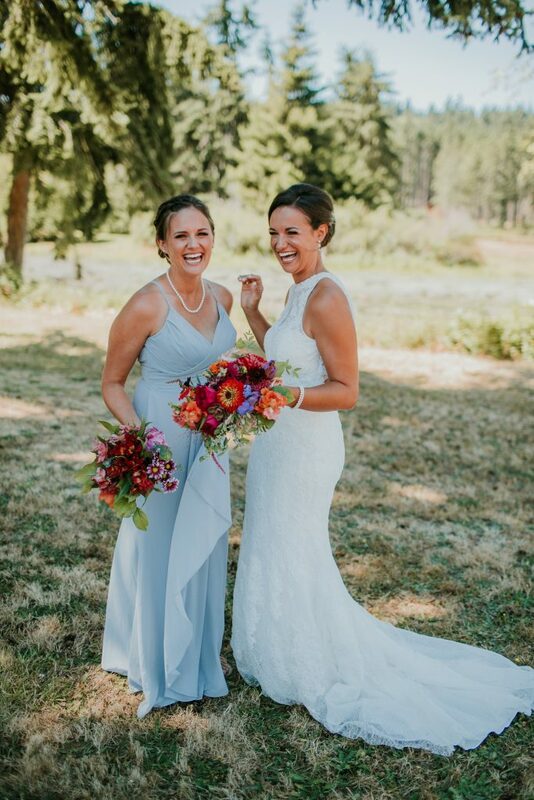 I was imagining that if J&M have done their fair share of hiking and camping, they’ve probably found themselves loving in the mists of the PNW forests! 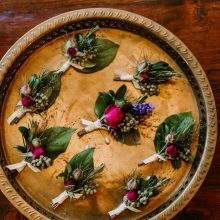 This was a DIY wedding where I created the bridal party flowers, and then helped write a recipe and source loose stems for the bride and her friends to arrange. 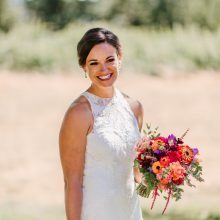 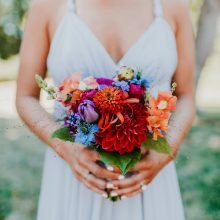 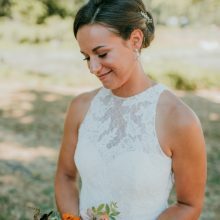 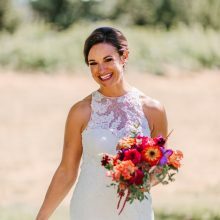 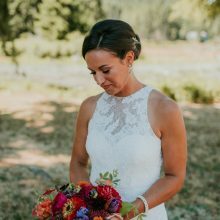 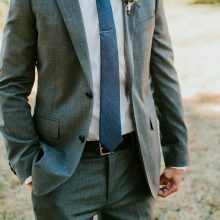 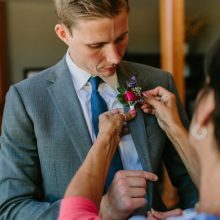 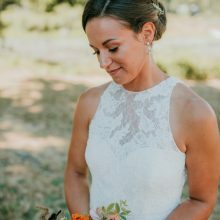 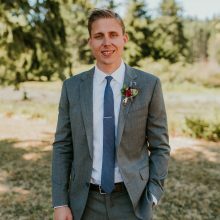 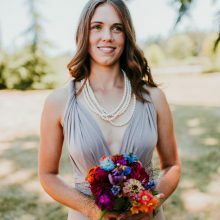 If you’d like to learn more about how I can help you save money, be organized, and get great results with your DIY wedding flowers, read here. 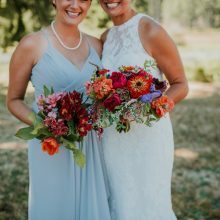 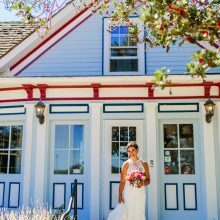 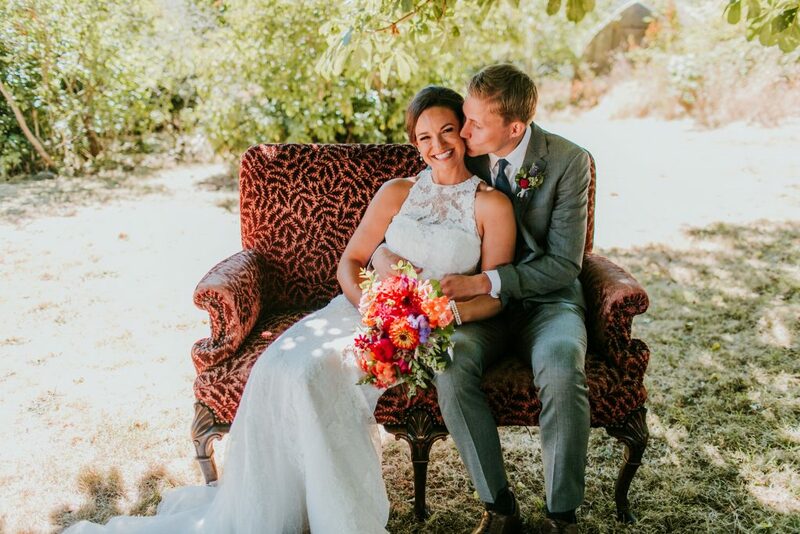 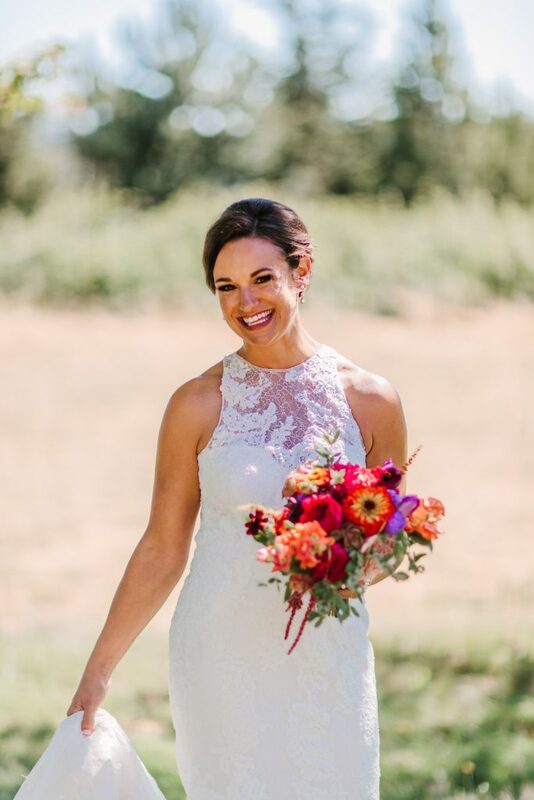 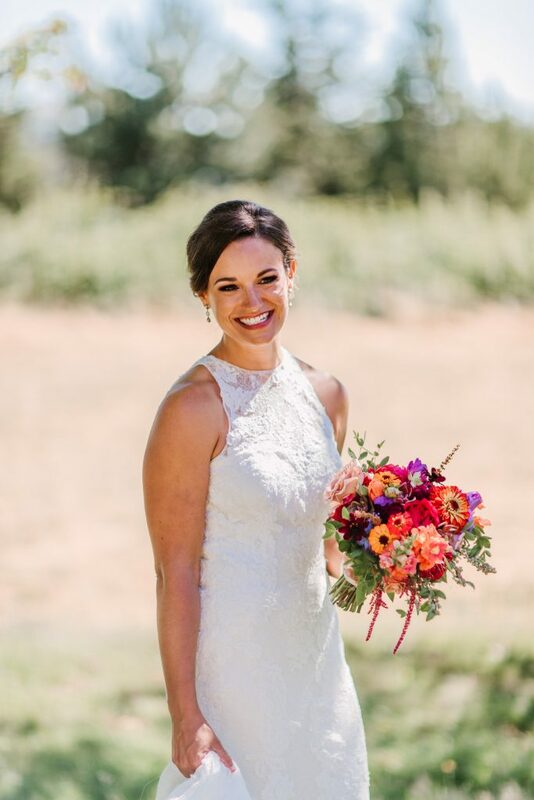 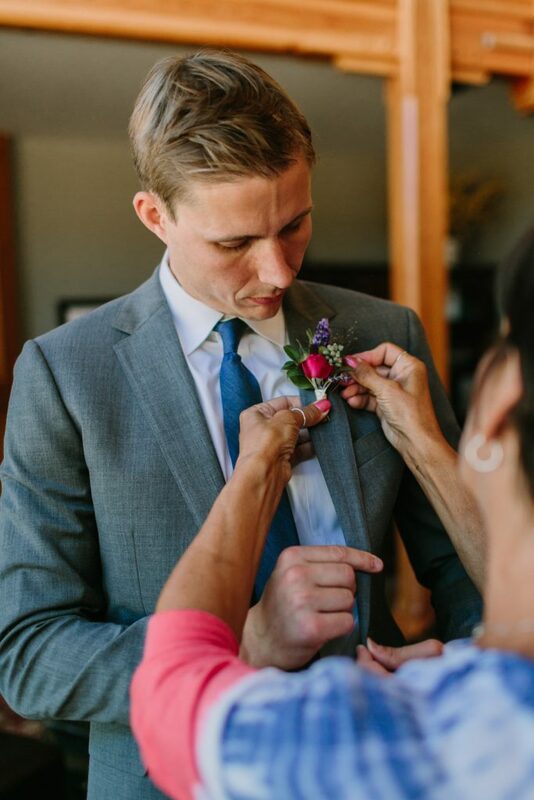 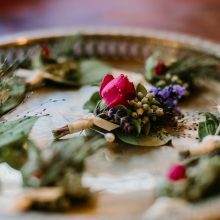 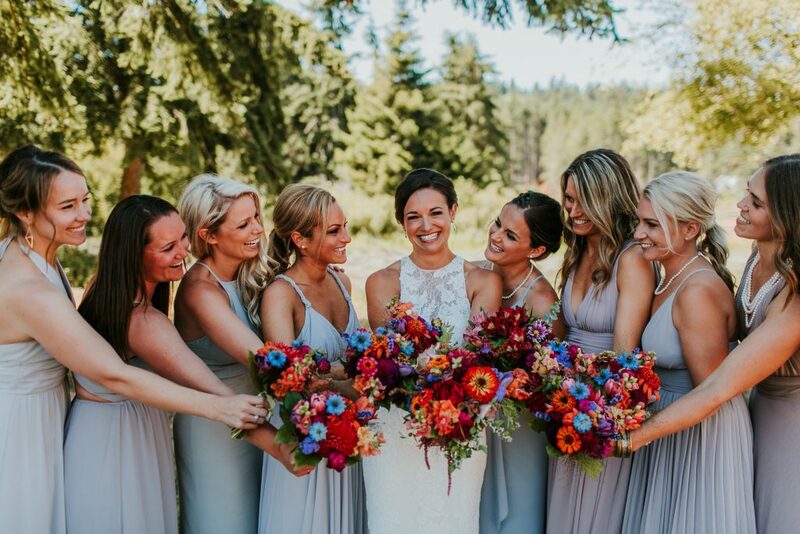 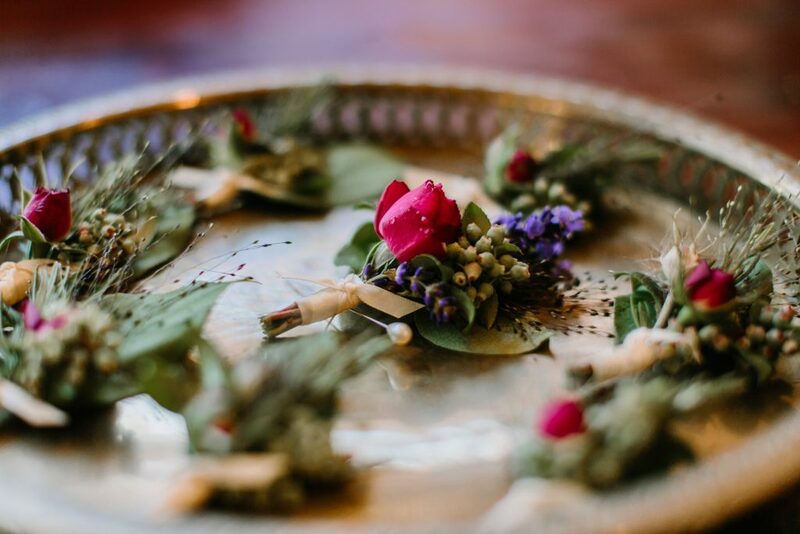 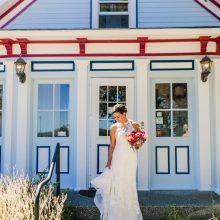 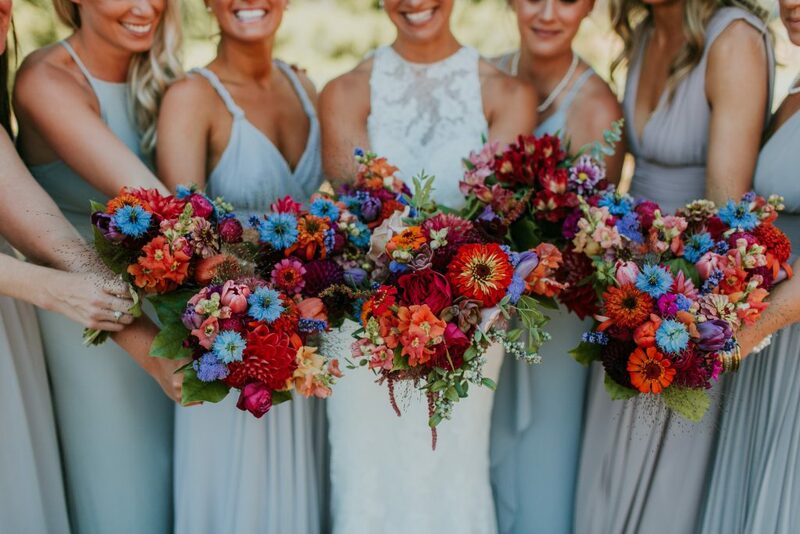 If you’d like to see how the rest of this wedding turned out, and how Jackie & pals did with their flower arranging, visit this post by the talented Kim at The Big Day Photography. 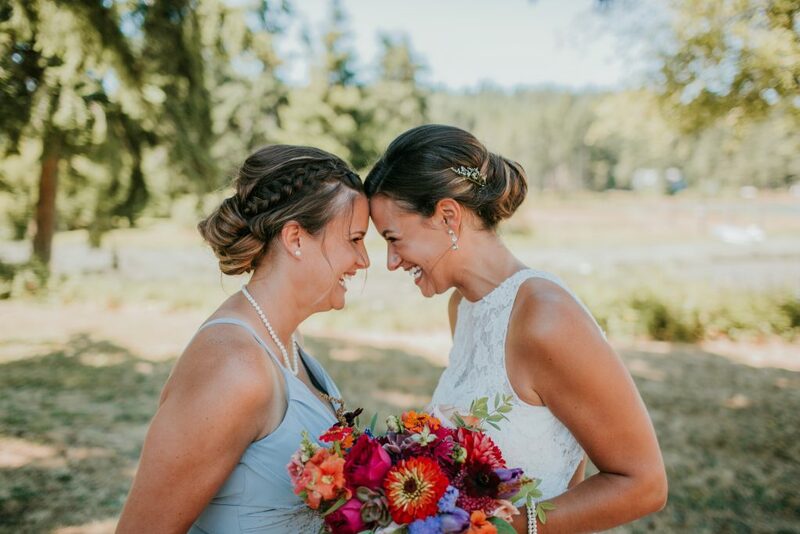 I’m very grateful for her for sharing these beautiful images with me! 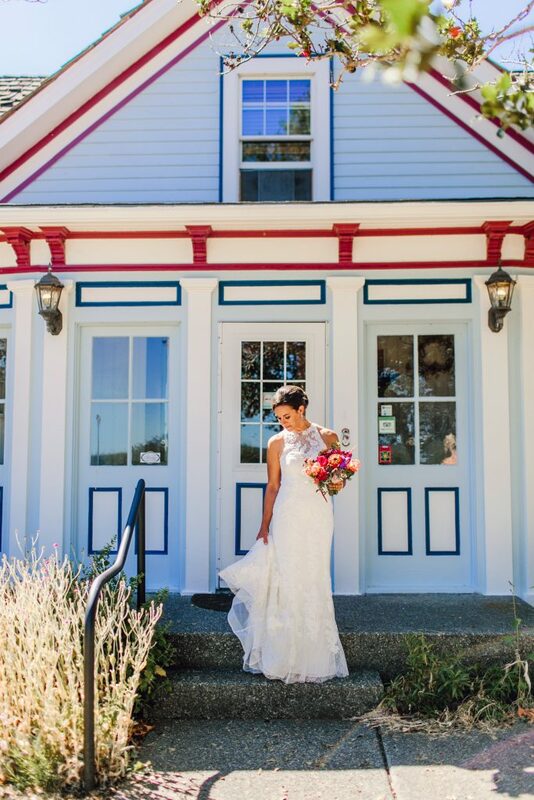 Next Post: Weddings In Woodinville Video!